Introducing an innovative approach to oral appliance therapy – a treatment platform featuring Oventus Airway Technology. 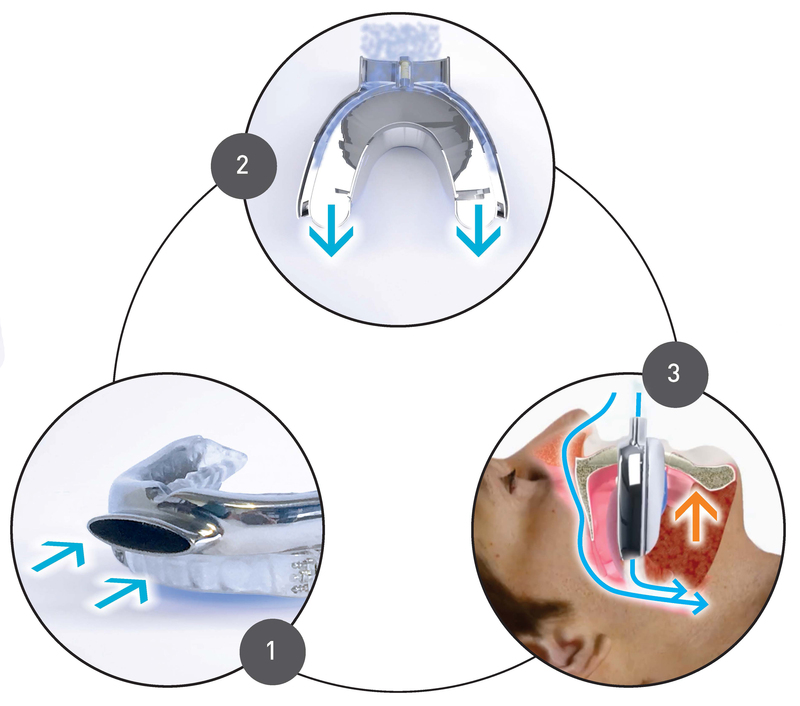 With a unique, low resistance airway incorporated into its patented design, the O2Vent™ customised oral appliances deliver unobstructed airflow to the back of the throat, allowing for breathing through the appliance, bypassing nasal resistance and velopharyngeal obstruction. The removable medical devices are fitted in the patient’s mouth and are intended to reduce or alleviate snoring and obstructive sleep apnoea, OSA. The Oventus O2Vent™ devices are for prescription use only. Find out more about Oventus Airway Technology. Watch this video to find out how the Oventus oral appliances can help snorers and sufferers of mild-to-moderate obstructive sleep apnoea (OSA). The Oventus portfolio currently includes three oral appliance options, all incorporating the Oventus Airway Technology. Dentists may select a product/titration mechanism based on clinical preference or variation in patient anatomy. anterior screw and adjustment key to optimise titration, locking the upper and lower trays together when in use and enabling lateral movement. A slimline winged appliance that uses a dual mechanism to stabilise and advance the mandible, still enabling opening of the mouth. The O2VentTM custom mouthguard devices are custom made to provide a perfect fit. The lightweight device has no mask or machines attached, making it easy to carry during travel, and store during the day when not in use. Air enters the mouth and is delivered to the back of the throat, so the patient can breathe through the device while maintaining an oral seal, to avoid a dry mouth or sore throat. How Oventus Airway Technology works. Nose breathing during sleep is ideal and patients should breathe though their nose to the extent they can. In the case of nasal resistance, nasal obstruction or soft palate collapse, a patient would normally experience a respiratory event or arousal and may then convert to mouth breathing, leading to an unstable airway. Oventus Airway Technology is designed to allow continued air flow to the oropharynx in the presence of nasal or soft palate obstruction. If device breathing is required during sleep, an oral seal is maintained and ventilation normalises. while the lips maintain an oral seal around the device extension. bringing the tongue forward and opening the airway.